Saundra Mitchell has been a phone psychic, a car salesperson, a denture-deliverer and a layout waxer. She’s dodged trains, endured basic training, and hitchhiked from Montana to California. She teaches herself languages, raises children, and makes paper for fun. 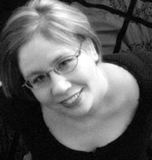 She’s the author of Shadowed Summer, The Vespertine, The Springsweet, and the forthcoming The Elementals and Mistwalker. She’s also the editor of the forthcoming YA anthology Defy the Dark. She always picks truth; dares are too easy. The Vespertine — (2011-2012) Publisher: During the summer of 1889, Amelia travels to Baltimore to live with her wealthy cousin, but soon after her arrival she begins having strange visions of the future. 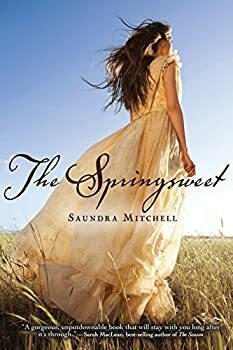 The Springsweet is a young adult historical fantasy set in the late nineteenth century, mainly in the Oklahoma Territory. It’s also a sequel to Saundra Mitchell’s 2011 novel The Vespertine, though I didn’t realize that when I ordered it. So the caveat to my review is that I read The Springsweet without that background. How does it hold up on its own? Quite well, actually. Shadowed Summer — (2009) Publisher: Nothing ever happened in Ondine, Louisiana, not even the summer Elijah Landry disappeared. His mother knew he ascended to heaven, the police believed he ran away, and his girlfriend thought he was murdered. Decades later, certain she saw his ghost in the town cemetery, fourteen-year-old Iris Rhame is determined to find out the truth behind “The Incident With the Landry Boy.” Enlisting the help of her best friend Collette, and forced to endure the company of Collette’s latest crush, Ben, Iris spends a summer digging into the past and stirring old ghosts, in search of a boy she never knew. What she doesn’t realize is that in a town as small as Ondine, every secret is a family secret. Breathkept — (2011) Publisher: Parker Nixon has never been away from home. She’s never been in love. And she’s never been wanted for murder… until now. The boy Parker got caught kissing last night turned up dead this morning, and there’s no shortage of suspects. Her reclusive father leads a double life, and the people at Stone Well Ranch have their mysteries too. But then there’s beautiful, broken Brandon Beauchamp. He saved Parker’s life once, and holds her heart in his hands. But he may be hiding the darkest secret of all. Mistwalker — (2014) Publisher: When Willa Dixon’s brother dies on the family lobster boat, her father forbids Willa from stepping foot on the deck again. With her family suffering, she’ll do anything to help out—even visit the Grey Man. Everyone in her small Maine town knows of this legendary spirit who haunts the lighthouse, controlling the fog and the fate of any vessel within his reach. But what Willa finds in the lighthouse isn’t a spirit at all, but a young man trapped inside until he collects one thousand souls. Desperate to escape his cursed existence, Grey tries to seduce Willa to take his place. With her life on land in shambles, will she sacrifice herself? CLICK HERE FOR MORE BY SAUNDRA MITCHELL.